My fascination with mystical stones is nothing new. Starring in the supernatural horror film The Stone merely rekindled my interest. It also reminded me that not all mystical stones are benevolent. It would appear some are evil. Not innately, but as a result of our obsession with the supernatural and our belief in the existence of forces we do not fully understand. Mystical stones have embodied the hopes and fears of seekers for thousands of years. Some are regarded as special due to their unique physical appearance while most appear relatively ordinary. Nevertheless, each has been imbued with extraordinary attributes. Take for instance, the Grail. In Parzeval, Wolfram von Eschenbach’s epic tale from the turn of the thirteenth century, the Grail was a stone from heaven called Lapsit Exillis. In this, the first Grail Romance to have an ending, the Grail stone was said to glow when used in ritual and to possess healingpowers for individuals who were deemed worthy. It also had the transformative ability to bring prosperity to a kingdom. Only later was the grail thought to be ‘holy’, due to its association with the blood that Christ bled while on the cross and the belief that his bloodline was preserved by the children he bore with Mary Magdalene. Most everyone has a theory about the Holy Grail, yet we forget that it was first and foremost a mystical stone; neither holy nor related to Christ. Stones from heaven are especially mystical and none more so than the Black Stone of Mecca. According to Islamic tradition, the mystical stone dates to the time of Adam and Eve and is believed to be a meteorite, like the Grail. 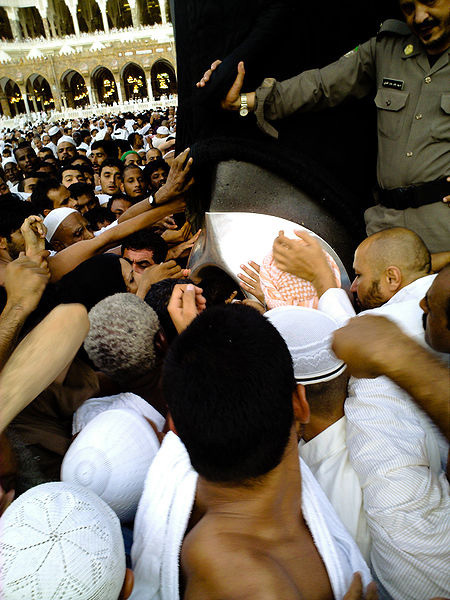 The Black Stone is the centre piece of an ancient Muslim pilgrimage known as the Hajj; a sacred journey where initiates kiss the Black Stone just as the Prophet Muhammad, descendant of Abraham, had done before them. The Black Stone is typical of pre-Islamic and other pagan traditions where the spirits of gods are associated with mystical stones. It is also part of tradition of mystical stones that are kissed by their seekers as part of a spiritual journey. In County Cork Ireland, a relic commemorated by millions of tourists reminds us of how enduring legends of mystical stones still are. 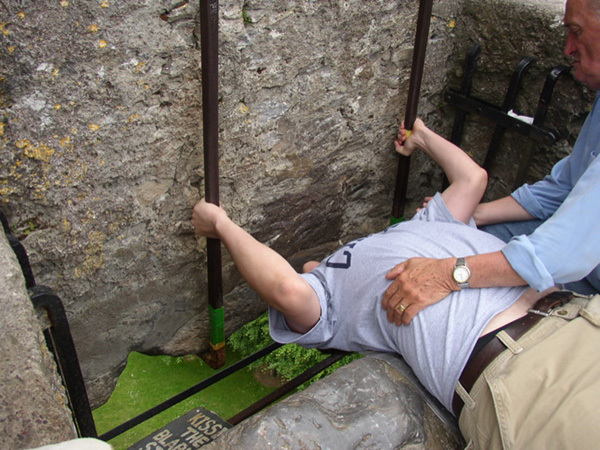 The Blarney Stone is imbedded in the castle of the same name and seekers kiss it in hopes of receiving the ability to speak cleverly in conversation. Like Mecca, pilgrims to Blarney Castle endure discomfort and danger in their quest as many who were suspended by their ankles before the stone have fallen to their death. Today, the dangerous ritual is recalled by the comparatively simple initiation of bending over backwards with the assistance of a castle custodian and kissing the stone while upside down. Both practices recall the peculiar tradition of the upside down god, as portrayed by the Hanged God in the Tarot and by Saint Peter, who is said to have been hung upside down. Other upside down gods include the Norse God Odin, who was hung upside down from the World Tree, an enormous ash called Yggdrasil, while he received insight into the meaning of the runes; an ancient writing system with magical implications. Many standing stones in Scandinavia date from the time of the Vikings and are carved with runic inscriptions. Most are over a thousand years old and are considered to be magical. 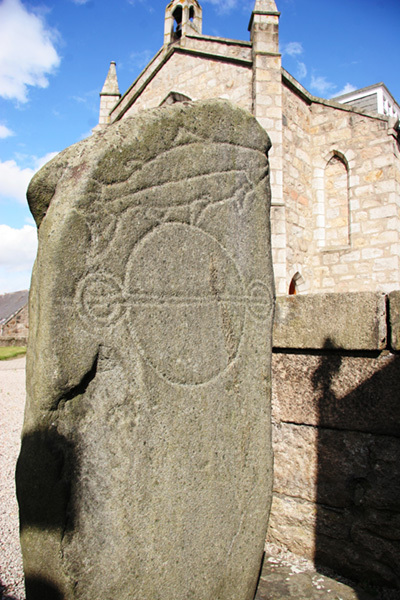 Scotland is another example of a country with a race of people, the Picts, who carved sacred images on standing stones. Additionally, the French Celtics of Brittany left behind a fascinating legacy of standing stones, stone circles and stone rows. While their purpose is unclear, their lingering presence feels sacred and auspiciousness, if not otherworldly. Many modern religions have recognized their sacredness and have built places of worship in the vicinity. Some believe that the Blarney stone was the mystical stone that Jacob slept on while dreaming of a ladder of angles that connected heaven to earth. The story is recounted in Genesis, where we learn that Jacob awoke from his dream and named the spot where he had slept Bet-El, or Bethel, meaning ‘House of God’. Bethel also means ‘bit’, or ‘bee’ in Egyptian, and the Egyptian delta was known as the land of the bee and the Pharaoh’s title was ‘beekeeper’. Not surprisingly, bees are strangely connected with mystical stones. Egyptians embraced mystical stones, including obelisks, whose tip featured a pyramid shape believed to represent a meteorite from heaven. Like Jacob’s ladder, it symbolised man’s connection with the celestial realm. Curiously, ‘bit’ also contains the same numeric value as meteorite (446), as expressed in Gematria, the ancient system of assigning a numerical value to a word or phrase in the belief that identical numerical values bear some relation to each other. In this instance, the association of meteorite with ‘bit’ infers that an ancient tradition ties Jacobs Pillow to a stone that has come to earth from heaven. The most important oracle in the ancient world was at Delphi, Greece, and here the notion of ‘bit’ (bees) and sacred stones are linked in a curious fashion. Legend asserts that the second temple at Delphi was constructed by bees and that the Omphalos Stone, an oracle stone that resembles a beehive and is designed with crisscrossing rows of carved bees. 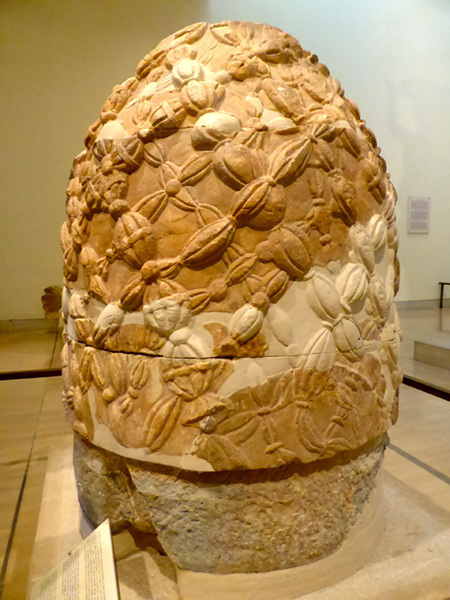 The Oracle was used by the ‘Delphic bee’, a goddess named Pythia who rejuvenated the tradition of shamanic female seers, a position of importance that later evolved into the role of Melissa and Sybil; sacred offices of gifted prophetesses who used sacred stones, like the oracle stone at Delphi, to predict the future. The practice of using mysterious stones to predict the future was not confined to the ancient world nor was it exclusive to women. In the 18th century the occultist John Dee used mysterious stones to consult the spirit world for guidance on matters of state, namely Queen Elizabeth I. Many believe that the prosperity of England was ensured as a result. 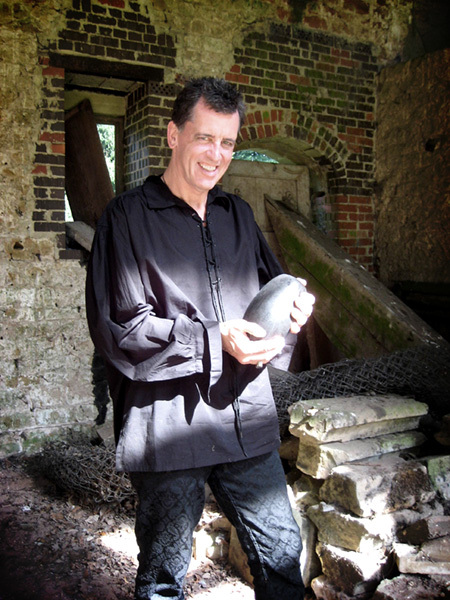 Dee’s instruments of divination included a smooth black scrying stone made out of obsidian, a type of volcanic glass, and a translucent crystal ball, each of which can be viewed in the British Museum. While it’s true history is uncertain the Blarney Stone, like Jacobs Stone, is said to have been one and the same with, or at least related to, the Stone of Scone, also known as the Stone of Destiny or Coronation Stone. 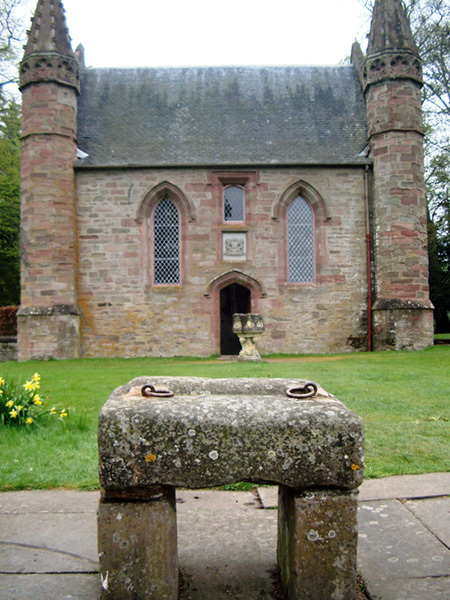 The infamous rock is thought to have been used by the Kings of Tara in Ireland, and as a coronation stone of the monarchs of Scotland in Scone Abbey, and later, by the monarchs of England, in Westminster Abbey. Blarney Castle’s claim that it’s stone is related to the Stone of Destiny remains to be confirmed, yet one thing is certain; it is one of a long tradition of sacred stones that were said to bring prosperity to those who encountered it. In Hindu mythology the God Shiva is associated with a particular type of stone known as a Lingam, and it is a Lingam type stone that is buried by the Druids at the start of the film ‘The Stone’ and which torments those who encounter it years later. Statues of Shiva and Lingam stones are found in temples across the ancient world. The meaning of the smooth black stone is complex, but its primary definition is around the notion of deception and disguise. Similarly, Shiva means the “auspicious one”, the destroyer god. 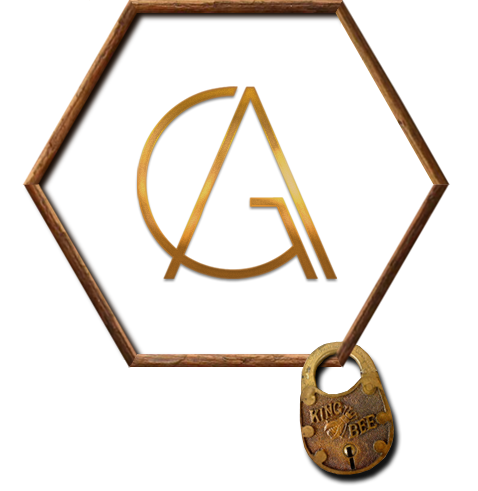 Together, the foreboding god and the trickster stone constitute a powerful symbolic union. The origins of Shiva’s association with the Lingam stone are uncertain but a recent discovery of an ancient seal in Pakistan may illuminate the matter further. During excavations at Mohenjo-daro, a province of the Indus Valley Civilization that dates to 2600 BC, archaeologists have unearthed what appears to be a “proto-Shiva” seal that portrays a man surrounded by animals. What’s interesting is that the man is portrayed with three faces, an apparent reference to the triple goddess symbol of Wicca, and two large and stylized animal horns on his head. The figure could easily be mistaken for the Horned God. 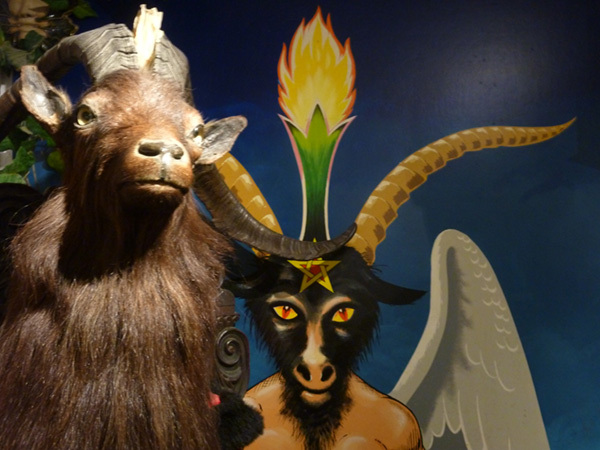 The Horned God is a pagan deity popularized by the relatively modern religion of Wicca. Like Shiva, he is associated with nature, wild animals, hunting and sexuality. He is also depicted with antlers or horns on his head, like the proto-Shiva seal. Curiously, the neo pagan veneration of the Horned God also includes the worship its female counterpart, the Triple Goddess. This ancient rendition of the ‘holy trinity’ refers to Maiden, the Mother, and the Crone, and is likely to have inspired the Christian trinity of the Father, Son and Holy Spirit. 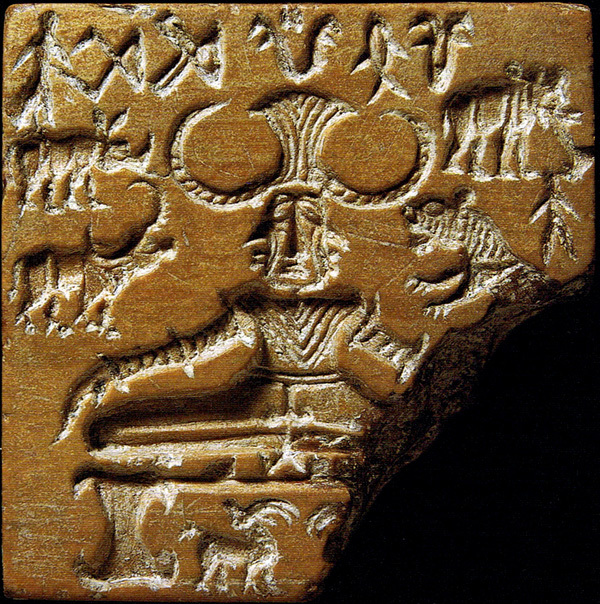 Amazingly, the proto-Shiva seal from Mohenjo-daro seems to represent both the horned god and the Triple Goddess. Depictions of horned gods permeate classical art and include paintings of Lucifer, Moses and the God Pan in horns. Is it any wonder that the archetype is indistinguishable with the devil? Arguably the horned god was first observed in French cave art known as ‘The Sorcerer’ in a cavern at Trois-Frères, Ariège, where many of the cave paintings date to over 30,000 years old. Thus, the notion that certain gods, such as Shiva and the Horned God being tied to the northerly or the southern hemisphere, or even a particular epoch, cannot be said with certainty. What we can say is that those who followed Shiva and the Horned God expressed its symbolism in the lingam stone that The Stone has reintroduced to cinema. It’s nice to see the old ways preserved.